This picture was taken in New Orleans the Friday night before Katrina hit. 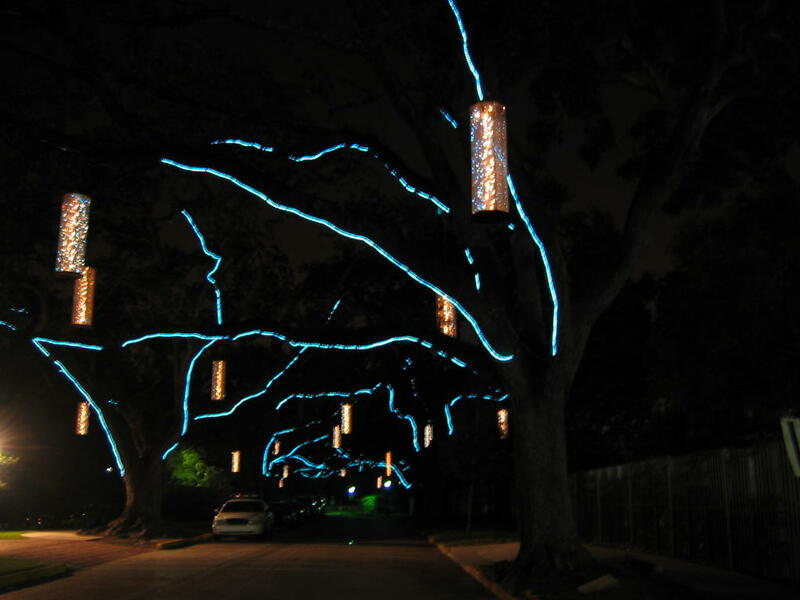 The blue lights are strung along the twisting curves of the ancient live oak trees lining the street just outside the Botanical Gardens in New Orleans' City Park. The silver lanterns, each about eight to ten feet tall, are suspended from the branches. Compared to the huge trees, they look like Christmas baubles. For a size reference, you can just barely see the front bumper of a white sedan parked next to the base of a tree at lower left. The tree's trunk is a bit wider than the car; the root base is much wider. "I really have the creeps about this Katrina storm. I'm having a premonition. This thing will hit Category Five. It will hit New Orleans. These trees will all be underwater next week." I started to say, "Dave, it's only a Category Two today. It shouldn't be disastrous." But the hair prickled on the back of my neck. Dave doesn't announce his premonitions lightly. Hurricanes always make New Orleanians nervous. This edginess is usually kept at bay with lame jokes. But this time, we didn't jest about it. Katrina was rapidly strengthening, with a one-way ticket to wherever the hell she wanted to go. "We're not staying for all the after-wedding stuff tomorrow morning," I announced. "We're going to get Mom early, and have her pack her important stuff, and we're taking her up to Baton Rouge." Dave nodded, and we entered the reception. People drank, people ate, people danced. My niece, Laura, was lovely in her mother's wedding gown and veil. Her mother, Susan, died from breast cancer several years ago, but I know she was in attendance anyway, and so proud. People spoke in low, nervous, tones about the hurricane. There were no half-hearted jokes about stocking up on beer and barbeque supplies. Instead, people were making plans to evacuate their families and pets, move their boats or find a hotel in Baton Rouge or Houston. This time, when the smokers stepped outside, they sipped their wine and glanced around anxiously, as though a mugger might be lurking in the meticulously groomed bushes nearby. People debated whether or not this storm would wrap up to a full Category Five. They wondered if it was worth the effort to board up their hunting camps in Mississippi and decided that would be a waste of time in the face of a Category Four or Five storm. In the face of a monster, the camps surely would be destroyed, boarded-up windows and all. Some folks wanted to move their valuables upstairs before they evacuated their homes. Others left the reception long before the refreshments were gone, so they could start packing. A few decided that loading up the RV was a good idea, so they could salvage a larger supply of belongings, have comfortable traveling accommodations for family and pets, and have a place to stay in the event of hotel shortages. These were sensible people. But they were also the lucky people -- people fortunate enough to have jobs and cars, credit cards and cell phones, and the materials and resources they needed to get out of town. These people were not among the 100,000 New Orleanians with no job, no car, and no way out. The next morning, we got up early, helped Mom pack, and headed out of town . As we drove toward Baton Rouge along the suspended highway over the swamps surrounding New Orleans, my mother worried aloud about the car-less citizens of the city she has always called home. My mother is a snap at in-your-head arithmetic. She said, "20% of the people in New Orleans don't have a car. That's about 100,000 people. You can only fit 40 or 50 people on a bus, so you'd need...let's see...2000? Maybe 2500 busses? And that's just to get people out of town. You also need more busses, to get them to the busses that would take them out of town. So you'd need twice as many busses --busses going back and forth from the neighborhoods to evacuation centers, and busses leaving town. People would be getting off one bus and getting on another. I don't think we have that many busses in the public transportation system, do you? Maybe if we used the school busses, too? But then who would drive all the busses? You'd have to get the National Guard to do that, because the bus drivers would have to take care of their own families, and you'd also need to have the handicapped busses going around door to door for the elderly, and the handicapped, and sick people who can't walk to the bus stops ..."
As my little silver VW Golf plugged along through the westbound traffic, Mom ticked off logistical considerations on her fingertips and mapped out a sensible evacuation plan for the car-less citizens of New Orleans, all 100,000 of them. "...and we have all these military bases that are closed. They have houses, gymnasiums, barracks, things like that. Why can't we use those? President Bush could snap his fingers and open up those old Army bases. If they started bussing people out right now, they wouldn't have to worry about people being trapped in the city if the levee breaks like it did in Hurricane Betsy..."
Being a car-less senior citizen herself, my Mom has had a great deal more experience with these issues than FEMA or the Bush administration, and, in fact, was working out a sensible and do-able plan for the evacuation of car-less New Orleanians 48 hours before Katrina hit and three days before the Bush administration even realized that there were, indeed, 100,000 people in one place in the United States of America, the most prosperous nation on Earth, with no car to get out of town, no money or credit to rent a car, no money for a hotel and no way to get themselves and their families to safety. Mom, of course, was right -- as Moms almost always are. She could have run an efficient evacuation right there in the backseat of my car if FEMA had given her a cell phone and a notepad and the authority to give people the go-ahead. I would nominate Mom for the new head of FEMA, but I know she wouldn't get the job, no matter how much common sense she has. She would be ruled out for being a Democrat. While Mom planned the human evacuation, I worried about the animal evacuation. I knew that many people were evacuating with their pets. I could see pet carriers in the cars and SUVs headed west, and the occasional horse trailer bouncing along behind a heavily-loaded pickup. But I also knew that a large number of evacuees were treating this like another "hurricane drill," and had left their pets locked in their homes with three or four days' worth of food and water, fully expecting to return home to their homes and their pets, fully expecting that New Orleans would, once again, be spared by a last-minute tease of meteorological capricousness. Many people left their pets in a place they thought would be safe, expecting to return home after a few days, certain they would pat their dog on the head while they barbecued, drank beer and watched the first game of the LSU football season. I knew there were countless animals with no owners at all, pathetic street dogs and feral cats surviving out of Dumpsters like they do on an ordinary day, with no idea they might soon be struggling for their lives if the storm surge crested the levees -- or broke them. We drove to Baton Rouge, a four-hour drive which normally takes 90 minutes. Those who evacuated later in the day on Saturday, and those who delayed until Sunday, faced much longer drives to get to safety. We got Mom settled onto the sofa-bed and got her things unpacked. I scurried around outside, securing things that might blow away in the 70-mph winds we expected as far west as Baton Rouge. I rounded up candles and flashlights and filled the ice chest, and we went about the business of Hunkering Down, parked in front of the Weather Channel and CNN. Mom kept her fingers busy with her rosary, I kept my fingers busy knitting my latest shawl, and Dave kept his fingers busy stroking the cats as we watched Katrina roll in from the Gulf, watched the Mississippi Gulf Coast get wiped off the map and watched the levees break in New Orleans. It wasn't long before I set the shawl aside. I simply could not knit. We listened to Katrina roar for the rest of the day, slamming us with winds near hurricane force over 100 miles from the eye of the storm, toppling trees and ripping down power lines. A neighbor's 90-foot water oak fell in the backyard, just missing their house. New Orleans filled with water. The ones who could not get out, people and animals, fled to the rooftops and to the Superdome. We watched the horrors, and watched some people get rescued. Then the power went out. The wind died down to turbulent gusts. We had something to eat, and then ventured over to a friend's house where the power was still on. Along with Mitch and Jane and their own evacuated relatives, we Hunkered Down in front of the TV and watched New Orleans drown. I've read your post 4 times, and still don't have the words to properly respond. Thank you for posting your story! And thanks to God for Dave's inspiration! Hi, I was just blog surfing and found you! If you are interested, go see my easy cookie recipe related site. It isnt anything special but you may find it interesting. Dez -- Fascinating insider perspective. Ken and I are so glad you and Dave had premonitions, and that you and your family are safe. The plight of the abandoned pets is heart-wrenching. Thank you for all the hard work you do to help them out, and in making their needs known. I would like everyone to read your very personal diary of the storm. It reads like the first chapter of a must-read/can't-put-down novel. Perhaps some day it will be. God bless you in your efforts to save the animals. Your strength and courage is an inspiration to us all.